I had a few people comment and email about the makeup I was wearing in last Tuesday's post. 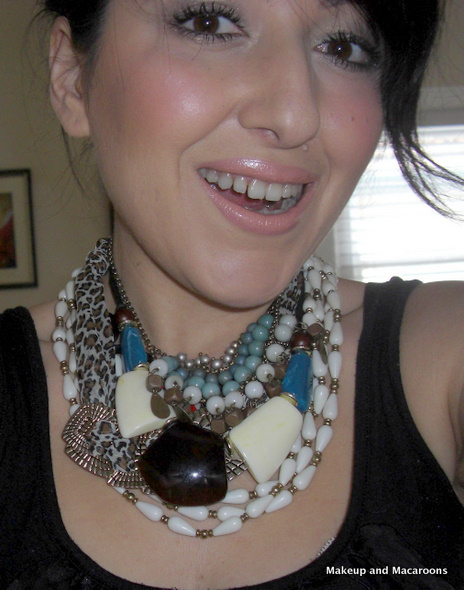 Here is the photo in question, where I was playing around with wearing my top 5 favourite chunky necklaces all at once! 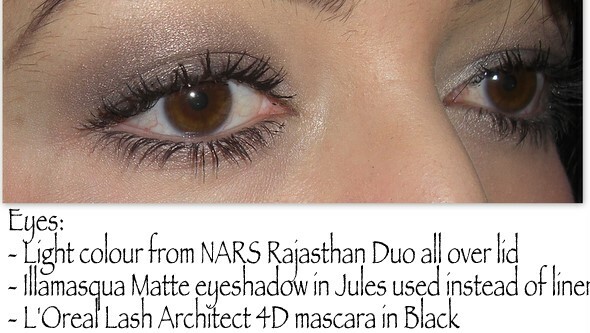 Since I still had some photos from that day I thought I will do a breakdown of the products used , even though it was such a quick look that I had put together. Plus I really wanted to show you that I don't always wear bright lipsticks. No, not always, just most of the time! This lipstick is a great cheaper alternative to MAC Hue. HERE is a post where I compared the two. This is pretty much my go-to look for those days when I can't be bothered doing much with my makeup. I normally choose an eyeshadow that can look great worn on its own, without much blending, put on lashings of mascara and finish with an easy to wear lip colour. What's your go-to look for lazy days? What are some of your lazy-day products? Love it! My lazy day makeup consists of powder foundation, mascara, and a neutral eyeshadow. 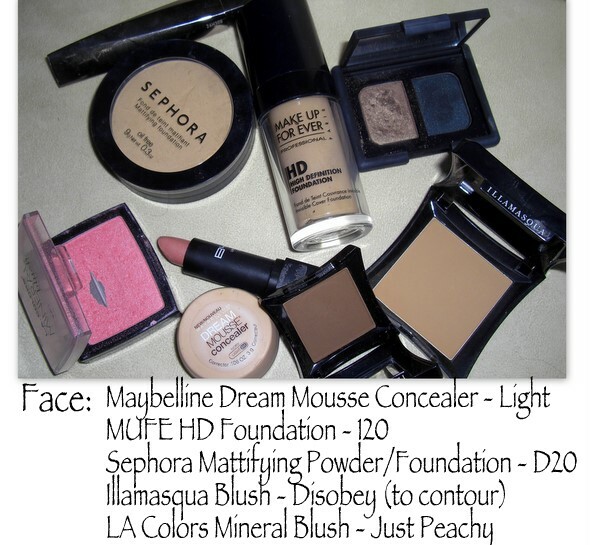 Do you have a review on the MUFE hd foundation? Omg I'm SO getting Rajasthan. You look beautiful here, I love how your makeup compliments your scarf in the bottom photo! Priyanka, Dani & Vanity Is an Addiction - I'll do a review of the HD foundation tomorrow. I'm actually not that impressed by it, so stay tuned! Silhouette Screams - considering it's less than $4 you have nothing to lose. I can't believe that's your lazy day makeup, you look gorgeous! haha, having one of those days today! I usually use a tinted moisturiser, concealer, bronzer (perk up my skin and do some light contouring with), apricot blush, one shadow, mascara an a lipgloss (revlon super lustorous in 'cherries in the snow' today). OMG LILIT. Those necklaces look AMAZING all together! WOW! Aww necklaces! I want them allllllll! I love your blush shade on your skintone! You look so pretty<3 I love the eyes, but the lip color is gorg too!! Everything's so perfect in this look. Nothing overwhelms, everything goes well together. <3 I love it! 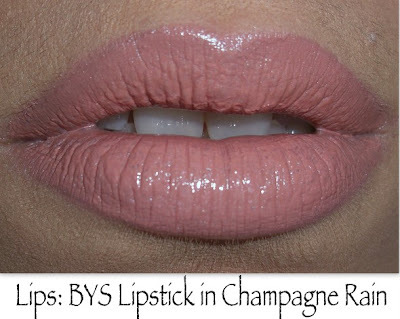 Gorgeous lipstick! One of my favourite 'lazy day' products is a BB Cream - there's very little blending and it takes care of any blemishes and redness. Your "lazy day makeup" is totally my fancy-pants makeup.